Honda Marine announced that it will be adding an all-new flagship outboard engine model to its reliable and fuel efficient lineup. Debuting at the 2011 Miami International Boat Show, the concept BF250 engine provides the first indication of the design direction for the all-new 250 horsepower (hp) outboard, which will be available to boaters in late 2011. The concept BF250 engine is based upon a unique 3.6 liter engine platform designed to deliver best-in-class fuel economy and outstanding performance for customers looking for more power with Honda reliability and quality. Along with that performance is a striking, sophisticated and elegant new exterior design that will be revealed when the production model BF250 engine is offered for sale later this year. The engine will incorporate a host of Honda exclusive features, including BLAST, VTEC, and Lean Burn Control to maximize the consumer’s experience. The model also will carry National Marine Electronics Association (NMEA) 2000 certification. In 2010, Honda Marine introduced its redesigned, fuel-efficient BF115 to consumers at the Miami Boat Show. Prior to that, 2009 brought the unveiling of its new BF60, with many of the performance and efficiency hallmarks of the Honda 75 and 90 horsepower siblings. In 2008, the company launched a new 105 Jet, as well as the fuel-injected BF40 and BF50 models. 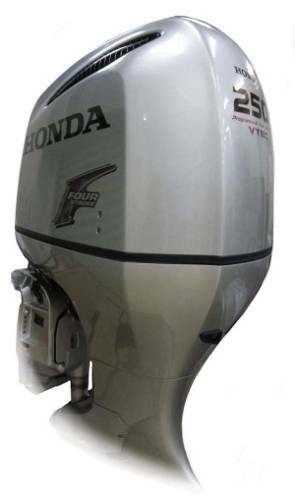 Honda Marine outboards share the same unparalleled durability, quality, and reliability of its legendary automobiles. With models ranging from 2 to 225 horsepower, Honda Marine’s full line of current production models meets rigorous California Air Resources Board (CARB) 3-Star standards, ensuring their availability and regulatory compliance in all 50 states.